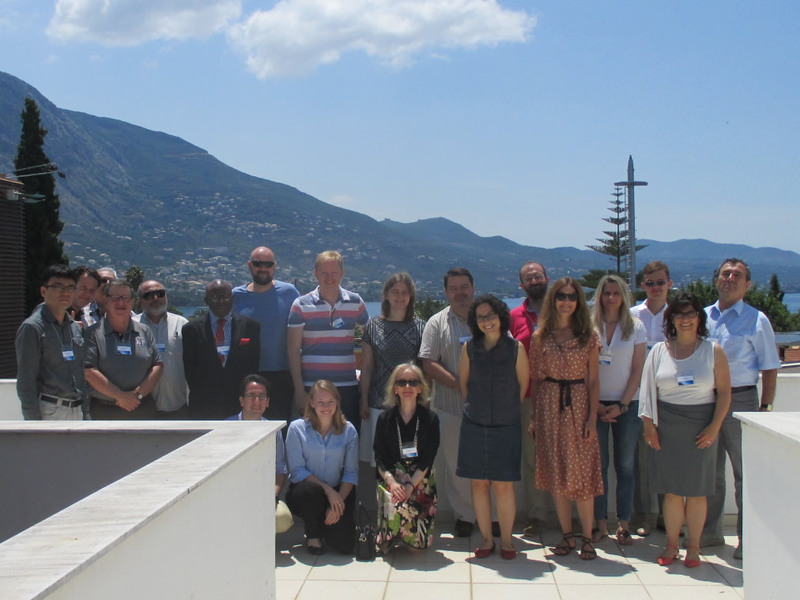 Today was the second day of the International Conference on Dynamics of Disasters, which is taking place in Kalamata, Greece, and which I co-organized with Professor Panos M. Pardalos of the University of Florida and Professor Ilias Kotsireas of Wilfrid Laurier in Canada. Below joining us in the photo are Professor Aleskerov of Russia and Professor Burcu Balcik of Turkey. This focused conference has had paper presenters from Denmark, England, Canada, the US, Russia, Sweden, Greece, Austria, Turkey, among other countries, which speaks to the timeliness and importance of the conference themes, which appear on the conference website. I have been delighted that there is even participation from the Isenberg School of Management alums, Professor Tina Wakolbinger and Professor Fuminori Toyasaki, both of whom were my PhD students in Management Science, and are now, respectively, Professor at the Vienna University of Economics and Business in Austria and Professor at York University in Toronto, Canada. Also, a recent alumna of the Isenberg School, Jenny Sargeant, who just graduated in May 2015 with her degree in Operations and Information Management, is also here and today even gave a talk. She had done a nice project and presentation in my Humanitarian Logistics and Healthcare class this past spring, and since there was a cancellation today, she gave her presentation in that slot. Jenny is now living in Germany and begins her job with the USO on Sunday. Below is a photo of the UMass Amherst contingent at this conference along with Professor Adenrele Awotona of UMass Boston! I am holding an Isenberg School of Management folder in which we provided the conference program. Thanks to Dean Mark A. Fuller and Associate Dean Tom Moliterno for support for this conference! I have enjoyed the talks immensely. The presenters come from different disciplines, including psychology and anthropology, earthquake engineering, and, of course, a good contingent of operations researchers and management scientists. This makes for very exciting discussions and presentation of different perspectives. There are also experts in disaster management and emergency preperdness here, experts in policy, and also transportation. The venue is spectacular as are the discussions. Below are photos of some of the presenters to-date. More talks are taking place tomorrow and I will continue blogging the conference. Special thanks to Professor Ilias Kotsireas, who has organized conferences before at the Elite Hotel in Kalamata, which is the venue for our conference. He has done an outstanding job making this conference possible. And, of course, with INFORMS Fellow ad OR/MS superstar Professor Panos M. Pardalos as a co-organizer, the conference has to be great! This is also a very historic time in Greece, which is making headlines around the globe, because of the debt crisis and the euro. As you may have heard, one can only extract 60 euros per day from a Greek bank account so there are many lines at the ATM machines. Those having US accounts are being allowed to take out more euros daily. However, as we experienced today, some of the machines are running out of cash and also many of the restaurants, etc., are no longer taking credit cards. The country is holding a referendum this Sunday. Below is a queue not far from our hotel at an ATM machine. 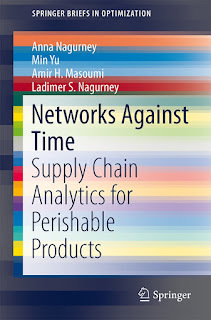 First Review of Our Book, Networks Against Time: Supply Chain Analytics for Perishable Products, and It Is Great! In my previous blogpost, I wrote about books that I am reading this summer, and I mentioned that one of the books that I had read (all 21 chapters of it) was the Handbook of Global Logistics, edited by James H. Bookbinder. I reviewed this book for the European Journal of Operational Research. Authors always anxiously await reviews of their books and I certainly am no different. 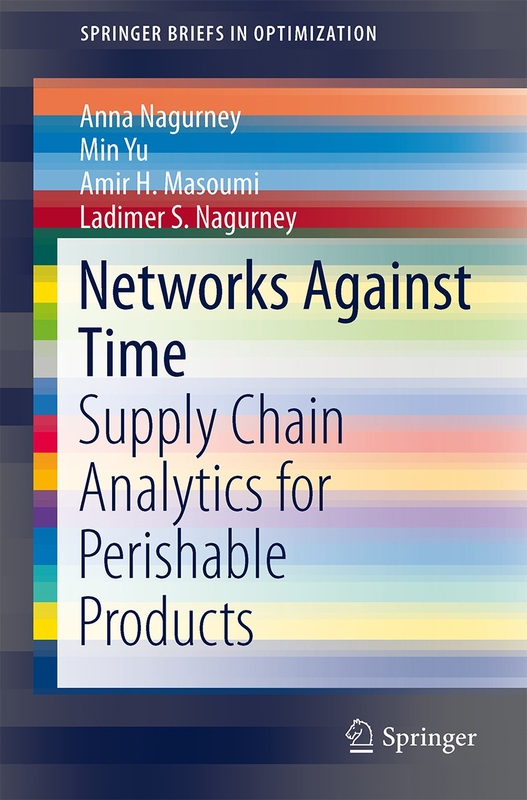 My most recent book (I am writing another one), which was published by Springer in 2013, is Networks Against Time: Supply Chain Analytics for Perishable Products. It was co-authored with two of my former doctoral students, Min Yu, who is a Professor at the School of Business at the University of Portland, and Professor Amir H. Masoumi, who is a Professor at the School of Business at Manhattan College, along with "the other Professor Nagurney," my husband, Ladimer S. Nagurney, who is a Professor of Electrical, Computer and Biomedical Engineering at the University of Hartford. The first review of our book is in and it was written by Professor Anna Corinna Cagliano of the Department of Management and Production Engineering, Politecnico di Torino, Italy. The review was published in the Taylor and Francis journal, Production Planning & Control: The Management of Operations. You can read the first page of the review online here. The first page overviews the organization of the book and its contents. On the second page of the review, Professor Cagliano writes: In my opinion, this book is a valid contribution to the discipline of supply chain management in the time-sensitive product field because it provides a systematic and analytic framework of analysis which actually lacks in the existing literature. Professor Cagliano also says in her review of our book: Both researchers and practitioners might benefit from reading the book. As a matter of fact, it can guide researchers in advancing knowledge about the topic by developing network problems and deriving associated solutions in various supply chain and competitive environments. In this way, they can define approaches that specifically capture the perishable and time-sensitive properties of products and services and the impacts they have on supply chain dynamics. In addition, according to Professor Cagliano: Practitioners, not only in the analysed industries, but also in other sectors, can find the present work as useful reference in understanding the structure and the behaviour of their supply chains and formulating appropriate management strategies to either establish or retain a competitive advantage in complex global marketplaces. To this end, they can be inspired by the numerous numerical examples and case studies provided by the book. My co-authors and I are very appreciative of Professor Cagliano's careful reading of our book and of her appreciation and understanding of its contributions. We thank her accordingly. This has been quite the eventful (and wonderful) summer. After a glorious month at the University of Gothenburg in Sweden we returned to Amherst and, in just the past few days, we took part in the Isenberg Business Leadership Awards gala in Boston and also celebrated my doctoral student's Dong "Michelle" Li's completion of her PhD and acceptance of a tenure-track Assistant Professorship job offer. Michelle had 3 such job offers and made her decision after careful deliberations. I am so proud of Michelle, who is my 18th PhD student, whose dissertation committee I have chaired. Below we are together after our dinner celebration at Judie's this past Monday evening. This summer, in addition to spending a month in Sweden, doing research, co-organizing a conference in Greece, which takes place next week, and making preparations for the EURO conference, plus the fact that I am also writing a book, I have had the pleasure of reading some great books (all nonfiction and appearing in the photo below). And to the authors and editors of these books there is a neat "connection." All the volumes in the photo above I received from the author or editor, except for the first one, The Handbook of Global Logistics, edited by James H. Bookbinder, which I got from the publisher, Springer, since I had the pleasure of reviewing this 21 chapter handbook for the European Journal of Operational Research, and the review is now in press. Bookbinder's inspiration for the handbook came out of a special issue of Transportation Research E, volume 41(6), 2005, on Global Logistics, that he guest edited. I admit I had a paper in that special issue: Global Supply Chain Network Dynamics with Multicriteria Decision-Making Under Risk and Uncertainty,, Anna Nagurney and Dmytro Matsypura, Transportation Research E 41: (2005) pp 585-612. I did not, however, have an invited contribution in the handbook that I reviewed. I read Bookbinder's magnum opus cover to cover and prepared the review of it while in Sweden (working many hours on it). I enjoyed the handbook a lot since the theme is of great interest to me and I also teach a course on Transportation and Logistics. The chapters are by different authors, some of whom I know very well. The book, Forecasting Urban Travel, by Davie E. Bouce and Huw Williams, I am now reading and I have read several chapters. It is over 600 pages and is a historical rendition of transportation forecasting over a sixty year period from US and UK perspectives. It is a massive, extensive piece of scholarship. The book is my nightly reading now as a reward for a good day. I am eagerly looking forward to Chapter 7 on Transportation Network Equilibrium. 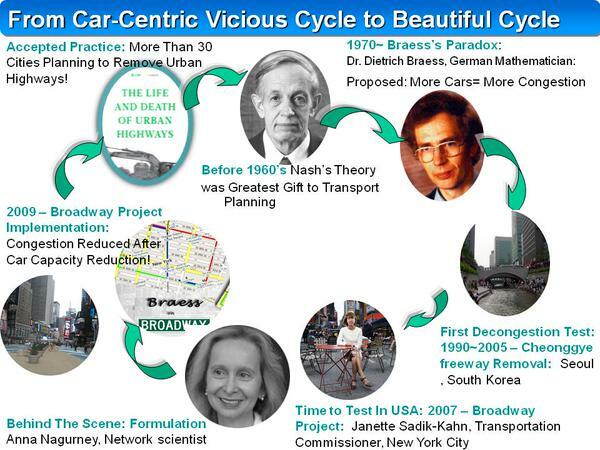 Transportation Network Equilibrium is a topic that was my first research passion (and that my dissertation advisor, Stella Dafermos at Brown University, contributed so much to). It was one of the themes of my dissertation at Brown University. I did get a preview of Chapter 7, since David Boyce, who has been a mentor and friend for many years, wanted my comments and feedback on it. This chapter, alone, I believe, is worth buying the book for since so many operations researchers and transportation scientists are noted there and their contributions. I am so honored to be cited in this book! The book, Telecommunications Network Economics, I am taking with me on my upcoming European 3 week sojourn. Patrick Maille, one of the authors (with Bruno Tuffin), sent me a complimentary copy. Given that my great collaborator, Tilman Wolf, and our Co-PIs on a big NSF grant, Jim Griffioen, Ken Calvert, Rudra Dutta, and George Rouskas, with our students, have been working on the Future Internet Architecture project known as ChoiceNet, for 4 years, now, this book should be a great read. And, yes, I peeked -- I am cited - specifically, my Supply Chain Network Economics book is, which I wrote while at Harvard. Patrick Maille is an Associate Professor at Telecom Bretagne (part of Institut Mines-Telecom) in France. This year he is visiting Jean Walrand’s team at UC Berkeley (I am a huge fan of Walrand's work). Maille has asked me to serve on his habilitation (Habilitation à Diriger les Recherches, in French) committee, that he will defending in Rennes, France in October. I have agreed. A habilitation, according to Wikipedia, is the highest academic qualification a scholar can achieve by his or her own pursuit in many countries in Europe, Central Asia, and Egypt... Earned usually after obtaining a research doctorate, such as a PhD, the habilitation requires that the candidate write a professorial thesis (or habilitation thesis) based on independent scholarship. I will also be reading his habilitation thesis this summer! The book, Innovation Spaces in Asia, edited by Maurren McKelvey and Sharmistha Bagchi-Sen, I received as a gift from Maureen McKelvey at a lunch in Sjobaren in Gothenburg, Sweden 2 weeks ago. Maureen is a great friend and an exceptional scholar and served, for several years, as the Dean of the Graduate School at the School of Business, Economics and Law at the University of Gothenburg. Her fellow co-editor, Sharmistha, was also a Visiting Professor at the school with me. Given the excitement surrounding innovation and entrepreneurship (and the Isenberg School received a gift of $10 million to fund the Berthiaume Center for Entrepreneurship, for example), this book I will be reading after returning from Europe. You may have noticed that the bottom set of three books featured above in the photo has a Swedish connection. I already mentioned the book co-edited by McKelvey, which I carried back from Gothenburg less than 2 weeks ago. I also carried the volume edited by Jonas Floden, Sustainable Intermodal Biofuel Transport, and the dissertation, Essays on Performance Management Systems, Regulation and Change in Swedish Banks, by Viktor Elliott, who successfully defended his dissertation while I was in Gothenburg and I went to the party. The defense itself was in Swedish so I waited in my office for it to be over with and then we celebrated with champagne (see photo below)! I have read parts of both of these books and have enjoyed them a lot. Jonas and I are obsessed with sustainability and supply chains and we have co-authored several papers together. At the EURO Conference in Glasgow, Scotland, in July I will be presenting our paper, Fashion Supply Chain Network Competition with Ecolabelling, Anna Nagurney, Min Yu, and Jonas Floden, Sustainable Fashion Supply Chain Management: From Sourcing to Retailing, T.-M. Choi and T.C.E. Cheng, Editors, Springer (2015) pp 61-84. Viktor's friendship I will always value. He was always ready and willing to give me lots of advice during my 4 year tenure as a Visiting Professor at the University of Gothenburg (including great restaurant recommendations) and for that I thank him! Congratulations to all the authors and editors of the above books as well as to the contributors of the edited volumes! There is nothing like a great book! And to those who are writing book, Happy Writing! 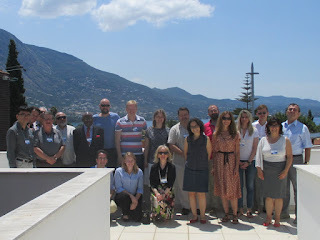 Hard to believe that, one week from today, I will be speaking at the Dynamics of Disasters conference in Kalamata, Greece, that I co-organized with Professor Panos M. Pardalos of the University of Florida and Professor Ilias Kotsireas of Wilfrid Laurier University. The paper that I will be presenting is on our lated research on disaster relief supply chain networks: A Mean-Variance Disaster Relief Supply Chain Network Model for Risk Reduction with Stochastic Link Costs, Time Targets, and Demand Uncertainty, Anna Nagurney and Ladimer S. Nagurney. The paper goes further than our earlier paper, An Integrated Disaster Relief Supply Chain Network Model with Time Targets and Demand Uncertainty, Anna Nagurney, Amir H. Masoumi, and Min Yu, in Regional Science Matters: Studies Dedicated to Walter Isard, P. Nijkamp, A. Rose, and K. Kourtit, Editors, Springer International Publishing Switzerland (2015), pp 287-318, which Amir will be presenting at the EURO Conference in Glasgow, Scotland in July. In our new paper, the model that we construct is the first to integrate disaster preparedness and response in a supply chain network framework with a mean-variance (MV) approach for risk reduction under demand and cost uncertainty and time targets plus penalties for shortages and surpluses. The MV approach to risk reduction dates to the work of the Nobel laureate Harry Markowitz (1952, 1959) and is still relevant in finance, in supply chains, as well as in disaster relief and humanitarian operations, where the focus, to-date, however, has been on inventory management. Our new model handles both the pre-positioning of relief supplies, whether local or nonlocal, as well as the procurement (local or nonlocal), transport, and distribution of supplies post-disaster. In the paper, we provide numerical examples for an island nation and also a case study focusing on storms hitting Mexico. The program for the conference can be downloaded here. I am very much looking forward to the exchange of ideas at what should be a very interesting, focused conference. Two of my former doctoral students, both of whom are very successful professors now, Dr.. Tina Wakolbinger and Dr. Fuminori Toyasaki, will be presenting at this conference. Also, it will be wonderful to see Dr.. Nurcu Balcik again, whose work with Dr. Benita Beamon, the students in my Humanitarian Logistics and Healthcare class at the Isenberg School get to read. I returned from my wonderful stint as a Visiting Professor in Sweden specifically for the Isenberg Business Leadership Awards event, which took place in Boston last evening. It was a gala affair with over 330 of our great alums, faculty, administrators, staff, students, guests, and honorees in attendance. The event took place at the Boston Colonnade hotel and it was spectacular! We had two UMass vans waiting for those who elected to travel this way by the Isenberg School and it was quite the road trip. I was the only female in a van with two of my finance colleagues (Professors Nelson Lacey and Hossein Kazemi), HTM (Hospitality and Tourism Management) Professor Bob Wilson, our Isenberg Editor, Lou Wigdor, and his son, Ari Wigdor (who recently returned from an Isenberg School service trip to South Africa), and Professor Sharma of Management, and my husband. It was quite the road trip (both to and back from Boston) with conversations that had us laughing out loud plus a lot of fun with Twitter exchanges. This was the third such Leadership evening and this time we were honoring Denise Coll, who had a meteoric career as President, North American Starwood Hotels, and is one of our HTM alums, and also Dr. Bernard T. Lee, who is an Online MBA alum, plus the Chief of the Division of Plastic and Reconstructive Surgery at Beth Israel Medical Center and an Associate Professor of Surgery at Harvard Medical School. Each spoke of the outstanding education that they received at Isenberg. Coll gave us a very entertaining overview of her first job, post college graduation, working as a planner and cook for a camp for 80 girls in western Massachusetts (they all survived the summer camp). Dr. Lee noted that he is in the business of heathcare and when he rose in terms of leadership positions he realized that what he really could have benefited from was courses in Operations Management and Services Marketing (I had to clap). My colleague, Associate Dean John Wells, who heads all of our MBA programs, gave Dr. Lee a wonderful introduction. Last year, one of my former students, Christina Calvaneso, who had also worked as an Associate at the Virtual Center for Supernetworks, that I founded and direct, under a sponsorship of an NSF grant, received the same award as Dr. Lee. Their speeches were truly uplifting and inspiring and are examples of the extraordinary students and alums of the Isenberg School that, we, as faculty, have the honor to teach and interact with. Beth Gamel. the Managing Director of Argent Wealth Management, was the emcee for the evening and her love of the Isenberg School and generous philanthropy set the stage for an evening of elegance, warmth, energy, camaraderie, and also celebration of the achievements of the school, especially, in terms of rankings under the leadership for the past half decade of Dean Mark A.Fuller. Dean Fuller gave a rousing speech with his usual energy, dynamism, and enthusiasm. I was so happy to see one of my former Operations and Information Management students, Maura MacDonald, who is now a Senior Associate at Grant Thornton in Boston. She was on the Host Committee. Below, I share photos with you, from the evening gala and networking, and, since we had about an hour after our arrival in Boston before the start of the cocktail hour, I have included a photo of some of the faculty heading to shop for a while. Congratulations to all concerned for an evening of special memories, delicious food, esprit de corps, and inspiring speeches! Gene Isenberg, who passed away not that long ago, and after whom our School of Management is named, I am sure was smiling at us from the heavens. Tomorrow is my last full day here in Gothenburg and it also marks the end of my tenure over 4 years as a Visiting Professor at the School of Business, Economics and Law at the University of Gothenburg in Sweden. I was part of its outstanding Visiting Professor Program, which I found out about in The Economist and applied. I have made 10 visits to this great school and university and today my colleagues hosted a delicious cake "fika" party in my honor. The cake was a layered one of passion fruit cream and chocolate bottom - yummy! My colleagues gave me stunning gifts of a book on Sweden, an elegant navy scarf with the university emblem patterned on it, and a beautiful blue crystal apple of Swedish glass. They also gave me a lovely card and note and the administrative assistant here who has been so accommodating and helpful in always finding me a comfortable office brought me a red glass heart. How do you say goodbye to doctoral students, who have now received their PhDs, some have gotten married, over the time period that I have been coming and some, including colleagues, have had children that I have met? I have laughed many times with my colleagues, both in Finance and in Transportation and Logistics here, since I collaborate with both, and we have shared many wonderful experiences.My research has benefited greatly through numerous discussions and papers, I might add, with Professor Jonas Floden, whose expertise in freight transport I truly value and have come to rely upon. I have gone to transport and logistics conferences here and a finance conference and have always felt so much at home here. Their friendship, humanity, and civility, and stories I will always treasure. I am now writing another book and in the acknowledgments I am thanking my colleagues and staff here at the University of Gothenburg. They say I am always smiling - it is because of the community that they have built in one of the greatest countries on our planet - Sweden. Thank you to the School of Business, Economics and Law and the University of Gothenburg for being such exceptional hosts. You will always be a part of me and I wish you all the best. As for future Visiting Professors, enjoy! And several of my colleagues said to me today - when are you coming?! It's always enjoyable to get a pleasant message whether through email, a phone call, in person, or even via a tweet. I have been mourning the tragic death of John Nash while in Sweden since he influenced so much of my work and was such an extraordinary individual. Last week, via Twitter, I received a message from Dewan Karim who tweeted the above infographic, which I thought was stunning. Obviously, it had taken him time to prepare so I contacted him to thank him and asked him for permission to post it in this blogpost, which he granted. Dewan tweets under Complete Mobility @DewanMKarim. He is a professional engineer and is a transportation planner in the greater Toronto area. Not only did he include John Nash, but also Dietrich Braess, of Braess paradox fame, whom I also admire so much, and had the pleasure of hosting at the Isenberg School back in 2006. Dewan told me that he attended the Traffic panel that I was a panelist on at the World Science Festival in NYC, which I wrote a post on. He became very interested in the Braess paradox which I spoke on and, in particular, relative to Mayor Bloomberg shutting Broadway from 42nd to 47th Street to vehicular traffic and converting it to a pedestrian plaza. This decision was made in conjunction with Dr. Janette Sadik-Khan. Interestingly, I last saw Dr. Sadik-Khan, of whom I am also a big fan, when she and I were panelists together on the Transport and Traffic at The New York Times Energy for Tomorrow Conference, also in NYC, in 2013. I like the above ninfographic so much that I will show it to my students in my Transportation and Logistics class at the Isenberg School next Fall. In any event, it is so nice to be on the same page with researchers and a practitioner I so much admire. I've been in Gothenburg for 3 weeks now, my tenth trip here as a Visiting Professor at the School of Business, Economics and Law (Handelshogskolan) at the University of Gothenburg. I have been immerse in writing a book and also discussing research topics with colleagues and also talking with doctoral students. Below I have a panoply of photos that show the charm of this city and Sweden. The Business School's cafeteria is fabulous but today was the last day of service of the academic year so I had to thank the chef and server. The public transportation is fabulous and I have 4 choices for commuting to work: walking (a good couple of miles), taking the trolley, taking a bus, or the ferry. Today I took the ferry home and the ride was free! The view was pretty great, too. Where else do you find color-coordinated blankets on chairs outside cafes in case you need them. The nature and preservation of it are spectacular. And were else can you find parts of a Viking ship (the museums are favorite destinations of mine)!